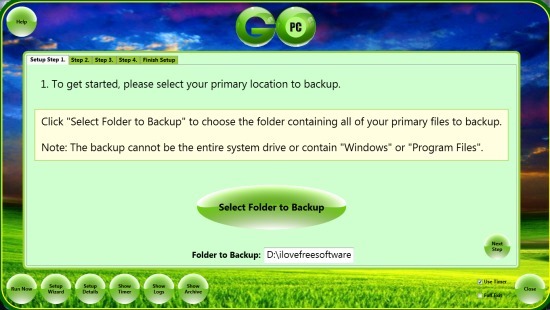 GoPC Backup is a handy data backup software that allows to backup a folder containing important files on scheduled time. It also helps to create an extra backup location for the folder that you want to backup. Thus, all your important stuff will be backup automatically (as a zip archive) on scheduled time and with additional backup device selected by you. It can even backup files on virtual host machines (a virtual machine that is operated and hosted from a remote cloud server), which makes it more useful, than similar software to create backup. You simply need to follow a backup wizard that will help to create data backup and backup will be done automatically on scheduled time on daily basis. 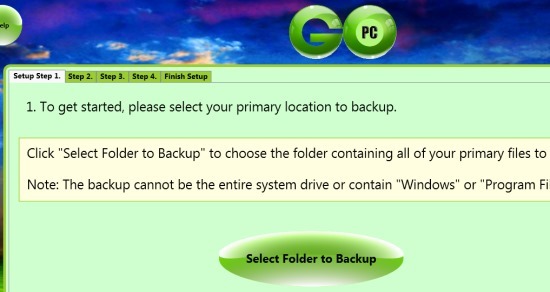 Screenshot above shows the data backup wizard of GoPC Backup where you need to follow simple steps to complete the wizard and schedule the data backup. A simple but very useful software to quickly create backup of a folder containing important data. Backup can be scheduled for daily basis. Once you have entered a time period, it will auto start data backup on scheduled time. A simple wizard helps to create and run data backup. You can also set data backup for any virtual host machine. You don’t need to install it. Very lightweight and free to use, licensed under MIT license. How To Use This Free Data Backup Software To Schedule Data Backup? Step 1: In this first step, you need to select the folder whose backup you want to create. Select a folder from your PC and go to the next step. Step 2: This step allows you to select the name of output backup file and a local archive location where the backup will be created. If you have a virtual host machine, then you can even enable option to create backup to virtual machine host. You need to establish a connection with that virtual host machine. 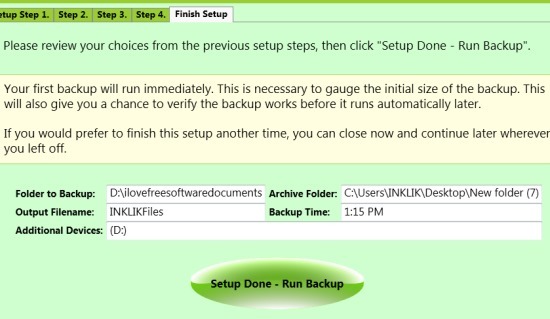 Step 3: In this step, you can select an additional backup device (say a flash drive if plugged in or computer hard disk). Step 4: It is one of the important step of GoPC Backup wizard. Here you need to select the backup time and then backup will be done automatically for each weekday on that particular time. Simply move GoPC slider to select the time. Step 5: Here you will be able to see all the settings done by you for running the backup. If you want to make any changes, then you can go back to any step. If not, complete the wizard by clicking on Setup Done button. After clicking this button, you can either run the backup immediately or later on scheduled time. You only have to keep running GoPC Backup on PC. You can minimize it to PC and backup will be performed automatically on scheduled time. Similar software: Backup Maker, Backup Folder Sync, and Cyotek CyberTools. GoPC Backup is useful for all those users who wants to keep their important documents safe. Auto schedule data backup for all weekdays is quite good feature. But this software is able to backup only a single folder at a time. It would be more useful if multiple folders could be backup in one go.